"We want change! We want change! We want change!" That was the chant roaring from the crowd gathered in front of the Old Capitol in Tallahassee, Florida, for the #NeverAgain Rally on Wednesday — one week after the worst mass shooting at a high school in U.S. history. 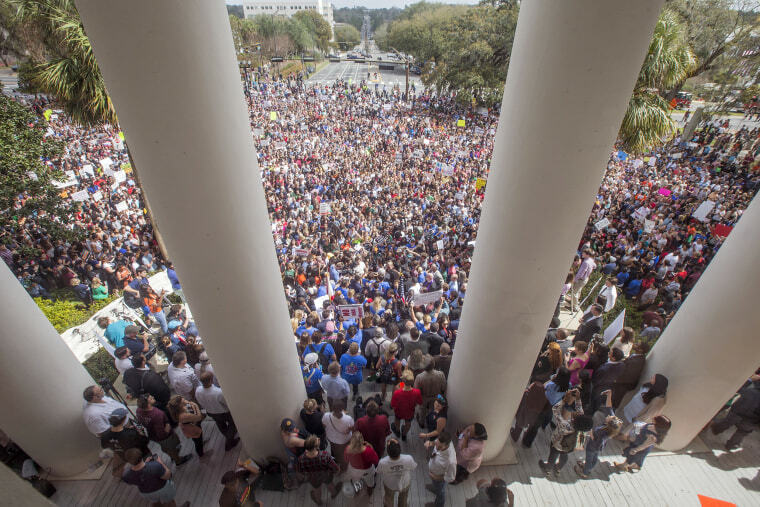 Students from Marjory Stoneman Douglas High School, where 17 people were shot dead by suspected gunman Nikolas Cruz on Valentine's Day, were among the thousands of Floridians and activists who came to the capital city to demand a change to the state's gun laws. Throughout the day, students also held meetings with lawmakers and Florida officials in both parties to discuss gun legislation. Their meetings included House and Senate members, Education Commissioner Pam Stewart, and Florida Gov. Rick Scott. The governor was slated to speak to groups of students at 5 p.m. — after he returns from another Parkland student's funeral. "This is not the Florida I grew up in. This is not the Florida I raised my children in. No child should have to live in the state of fear," Florida House Minority Leader Janet Cruz, who was visibly shaking with emotion, told the crowd at the rally. "There’s no reason that children in the United States of America should understand how it feels to lives in a war zone. Our legislative process here, you know what it is? It’s bulls--t!" Before the rally had even begun, students in South Florida walked out of their schools in protest of gun violence in the state. At Cypress Bay High School in Weston, Florida, hundreds of students rallied at a nearby park before heading back inside. Although they were hundreds of miles from the capitol, droves of students held signs demanding a change to the gun laws. Even more signs were waved In Tallahassee where over a dozen speakers, including state representatives, senators, activists and students, shared their desire for change with the boisterous crowd that chanted in agreement. Florance Yard, a student a Stoneman Douglas, told the protesters that her parents fled war-torn Lebanon so their children would be safe. They never dreamed their child would face a school shooting in America. "We cannot protect our guns before we protect our children," she said. "We need limitations on assault weapons." Hundreds of hands flew up when retired NASA astronaut Capt. Mark Kelly, whose wife, former Representative Gabrielle Giffords, survived being shot at point-blank range, asked the crowd who planned to vote in the 2018 midterm elections. "You have to do that," he said of participating in elections. "And you have to vote for people who have courage to stand up to the gun lobby. So have courage." Before the meeting with Scott, Stoneman Douglas students slammed lawmakers for remaining stagnant on gun reform in Florida. Student Delaney Tarr told the legislators that she was tired of being told by politicians that she and her classmates are in their thoughts. "We've had enough of thoughts and prayers. ... If you supported us you would have made a change long ago and you would be making change now," Tarr told reporters inside of the Capitol building. "So this is to every law maker out there. No longer can you take money from the NRA ... because we are coming after you." The rally and meetings in Tallahassee aren't the only action Stoneman Douglas students have planned. They're helping to organize a nation-wide school walk-out on March 14 and a "March for Our Lives" in Washington 10 days later.